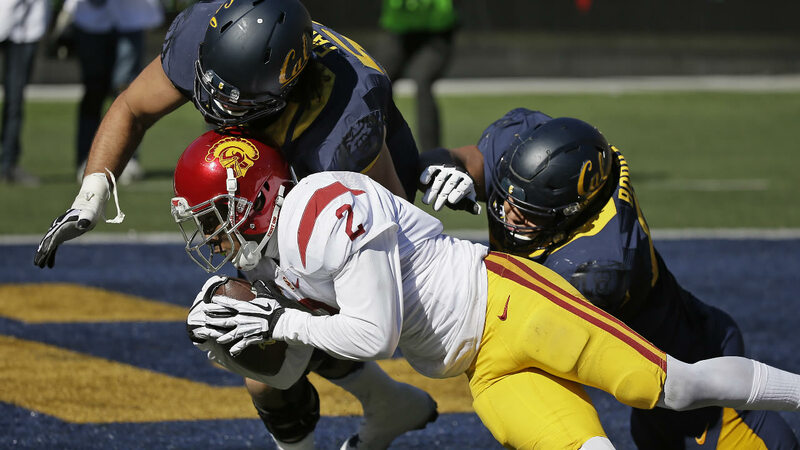 BERKELEY, Calif. -- A game that was billed as a showdown between two of the Pac-12's top quarterbacks in Cody Kessler and Jared Goff was decided by Southern California's defense and running game instead. Adoree Jackson returned an interception 46 yards for a touchdown and Ronald Jones ran for 80 yards and a score to lead USC to its 12th straight win against California, 27-21 on Saturday. "We have a formula right now to run the ball, stop the run and don't turn the ball over," interim coach Clay Helton said. "It was a tremendous team effort." Tre Madden also had a touchdown run a key third-down conversion that helped run out the clock for the Trojans (5-3, 3-2 Pac-12). Kessler completed 18 of 22 passes but only threw for 186 yards while missing star receiver JuJu Smith-Schuster for much of the game with a broken bone in his hand. "This game was won by our offensive line," Kessler said. "Our defense did great, but offensively on that side of the ball, our offensive line won this game along with the running backs. I was so proud of them. They did such a great job." Jared Goff threw the interception that put the Golden Bears (5-3, 2-3) in a 17-point hole in the third quarter and sent Cal to a third straight loss. Goff threw for 272 yards and two TDs, but was intercepted twice as the Bears are still searching for that elusive sixth win that will make them eligible for a bowl for the first time since 2011. "Very frustrated," Goff said. "We've let some games slip away from us. We started off hot and haven't been able to finish a game in these last three games. But I don't think that's going to keep us down." While Cal's hopes to contend in the Pac-12 are dwindling, USC's are rising with the two big wins under Helton. The Trojans beat then-No. 3 Utah 42-24 at home last week followed by another win against Cal. USC had lost three of its previous four games and fired coach Steve Sarkisian during that stretch after beginning the season with hopes to contend for a championship. The Trojans took control of this game with two big plays in a span of 23 seconds in the third quarter. First, Madden capped a 67-yard drive to open the second half by scoring on a 2-yard run on fourth-and-1. Helton said the decision to go for it was about "giving them the opportunity to say, 'Guys, this is Trojans football. When it's time to run the ball, we have to take care of our opponent.'" On the next play after the kickoff, Goff was pressured and threw up a floating pass that Jackson intercepted and returned for the score that made it 24-7. Jackson, who came into the game with 17 catches and two TDs on offense, added another score on his first interception of the season. "Since it was my first one, I might as well try to score," he said. "I had great blocking by Chris Hawkins and everybody else on the defense." Cal answered with a TD drive of its own capped by a 6-yard run by Daniel Lasco but Kevon Seymour intercepted Goff early in the fourth quarter to preserve the 13-point lead. Goff hit Stephen Anderson with a 9-yard touchdown pass that made it 27-21 with 3:52 to play. But Madden converted a third-and-1 when he popped outside for a 14-yard gain after being hit in the backfield. Justin Davis then converted a third-and-6, allowing the Trojans to run out the clock. The Bears struck first when Goff hit Bryce Treggs with a 6-yard pass on fourth-and-1. That marked the first time since 2007 that Cal led USC at any point in a game in a sign of how one-sided this rivalry has been. Cal didn't enjoy the lead for long as the Trojans tied the game on a 13-yard run by Jones and took the lead for good in the closing seconds of the half on a 22-yard field goal by Alex Wood.